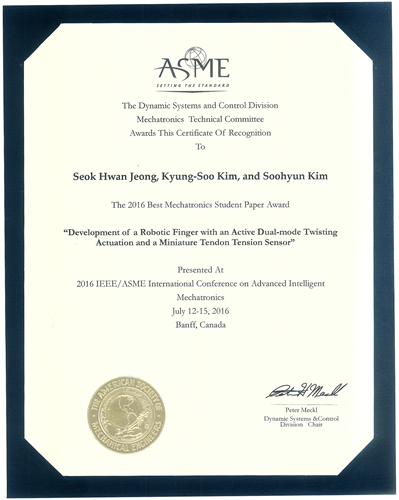 Seok Hwan Jeong (Ph.D. candidate, Advisor: Kyung-Soo Kim) won ‘The 2016 Best Mechatronics Student Paper Award” at the ASME Dynamic System and Control Conference (DSCC 2016) which was held at Virginia, USA from Oct 11 to 13 with the paper “Development of a Robotic Finger with an Active Dual-mode Twisting Actuation and a Miniature Tendon Tension Sensor” (presented at AIM 2016). This award is to recognize the best original paper in the area of mechatronics presented at a DSCD-sponsored event (DSCC, AIM, ACC) in the calendar year preceding the award. 정석환 박사과정 학생(지도교수: 김경수)이 10월11일(수)-13일(금)에 미국, 버지니아에서 개최된 ASME Dynamic System and Control Conference (DSCC)에서 ‘Development of a Robotic Finger with an Active Dual-mode Twisting Actuation and a Miniature Tendon Tension Sensor’ (2016 AIM에서 발표) 논문의 메카트로닉스 분야의 우수성이 인정되어 ‘The 2016 Best Mechatronics Student Paper Award’ 를 수상하였습니다. 이 상은 DCSD의 후원을 받는 DSCC, ACC, AIM에서 한해 동안 발표된 논문 중 메카트로닉스 분야에서 최고의 우수성이 인정되는 논문에 수여 됩니다.